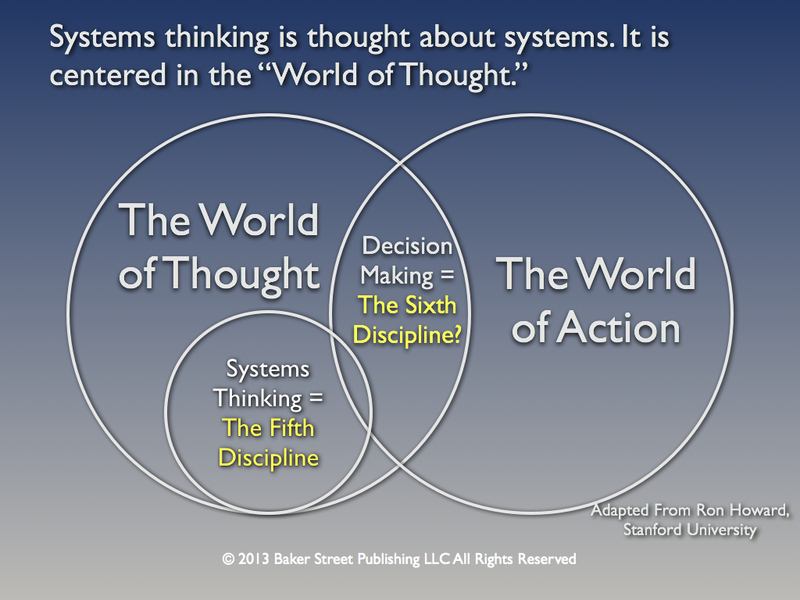 In 1990 Peter Senge coined the term “Fifth Discipline” to describe system thinking. He made compelling arguments why system thinking is so important. A large community of systems thinkers developed and the practice of systems thinking flourished. One of my favorite references is “The Fifth Discipline Fieldbook.” It captured many pragmatic aspects of system thinking at the time. To impact the world there has to be an action. Thinking is pretty much a purely intellectual endeavor unless it is focused on some action. Decision making is thinking about action. It is actionable thought. To get action we need a decision. The concept is captured in the Venn Diagram on the left. 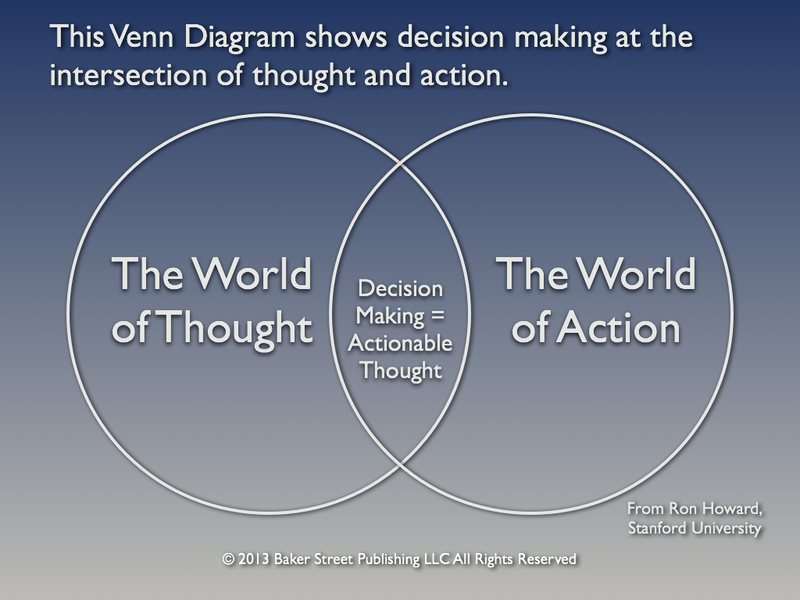 While Senge was busy raising the consciousness of system thinkers worldwide, a group of systems thinkers in and around Stanford were focused on decision making. 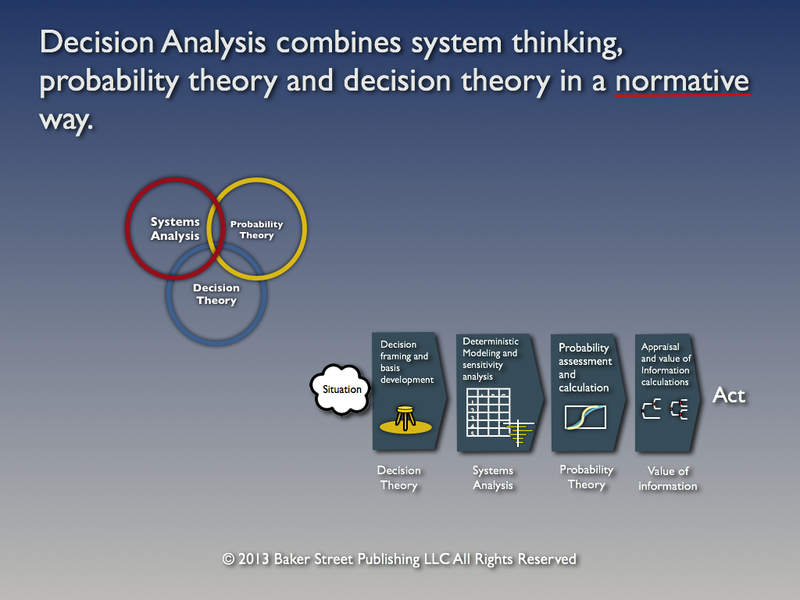 In the mid-60’s Professor Ron Howard coined the term “decision analysis” to capture the essence of a process that combined system analysis, probability theory, and decision theory. (Go to Baker Street Publications for a tutorial on the Decision Analysis Process.) A decision analysis group was formed at the SRI think tank and within a few years several consulting groups spun off from SRI. They included Applied Decision Analysis, Decision Focus Incorporated, and the Strategic Decisions Group. Meanwhile, in academia the Decision Analysis Society of INFORMS was formed. Today it has a Journal and over 1000 members. The consulting companies that spun off from Stanford and SRI focused on strategic decisions in corporations and government worldwide. The kinds of strategic decisions they addressed are shown in the McKinsey Survey slide. These kinds of decisions typically involve many people: executive decision makers, stakeholders, and experts. An expanded process evolved to meet the needs of these kinds of decisions. The Collaborative Design Process evolved out of thousands of professional engagements. It encompasses framing, alternative generation, analysis and synthesis. It recognizes the importance of design as well as creativity and analysis. 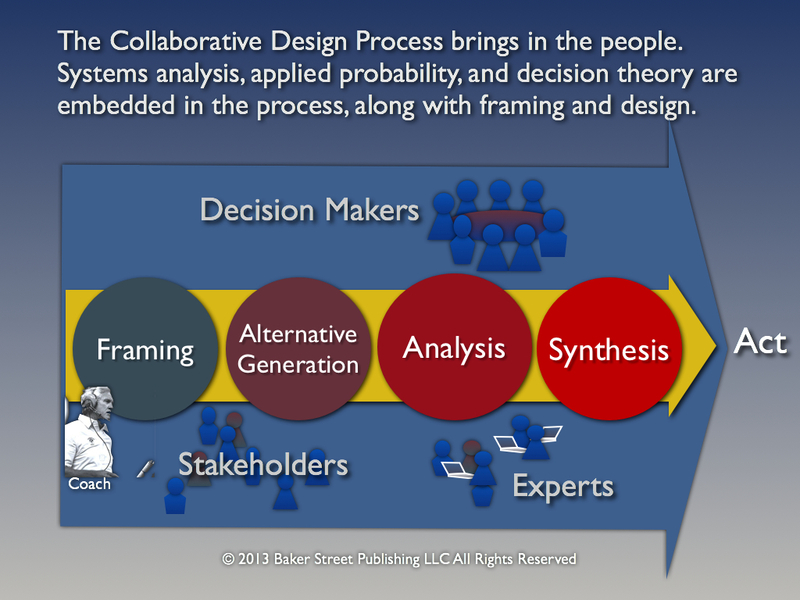 (Go to Baker Street Publications for an introduction to the Collaborative Design Process) The process is used extensively in many major industries: energy, pharmaceuticals, automobile and many others. Recently a group of practitioners has formed a professional association, The Society of Decision Professionals. It has about 1000 members.